There are 2 villages on Koh Mak 'Ban Ao Nid' on the Easthern coast is home to 50 families and has a population of 210 and 'Ban Laem Son' in the north of the island has 39 families with a population of 124. The total population of Koh Mak and the Koh Mak sub-district is nearly 900 this includes neighbouring islands Koh Rayang Nok, Koh Rayang Nai,Ko Pee, Koh Kham, and Koh Kradat. In total there are 21 islands, 9 habited and 12 uninhabited that make up the Koh Mak sub-district. Koh Mak is the 3rd largest after Koh Chang and Koh Kood. 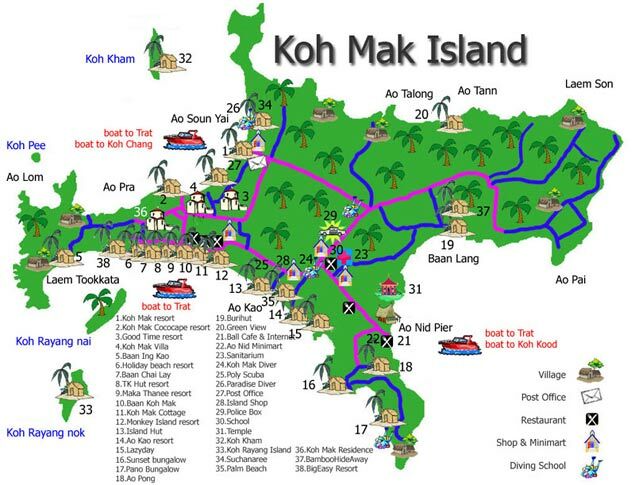 Koh Mak is approximately 10 km from north to south and 5 km from east to west. The coastline is 26 km and has many beautiful white sand beaches. In particular the beaches of 'Ao Suan Yai' on the west side and 'Ao Kao' on the south side are long and deserted. Most of the island is still covered by coconut and rubber plantations which is the island's main export products. Many of the locals also make handicrafts from coconut shells, batik fabrics and furnitures. The oil extracted from coconuts can also be refined into a medical oil. See at page "Koh Kood"
From Ao Kao Resort you can easily visit the near by Islands such as Koh Rayang, Koh Kra, Koh Kham, Koh Kradat or Koh Kood. There are 5 types of fan and air-conditioned rooms are located next to the beach. The fan run are ranging from 850 per night. The large and more comfortable air-conditioned are going for 1500 + per night. A Internet Café is attached to the restaurant. Kayaks, bicycles, snorkeling and fishing equipments are available for rent. It's a very good place to see the sunset. Ao Soun Yai Beach - arguably the prettiest bay on the island, there are two islands offshore, Ko Phi to the west and Ko Kham to the north, the later of which has one bungalow operation. This area is great for sunsets. Ao Nid - the south-eastern bay of Ao Nid is virtually devoid of sandy beaches, but is quite picturesque nonetheless and is a great place to catch the sunrise. There's just the one place to stay.